That's actually drawn with only CSS, using the pseudo-elements ::before and ::after. We start with a simple HTML list. With this out of the way†, let's get into the CSS. First we need to set up the list and container so it doesn't interfere with our tree drawing. Then we take our pseudo-elements, make sure they are empty and move them to the left of the list elements. The ::before pseudo-element is used to draw the horizontal lines. ...and the vertical lines use the ::after pseudo-element. The icing on the cake is that the last item on every level has just a very short line leading to it, and nothing further. This makes it look very nice. And that's it! I think it's fascinating something like that is possible. 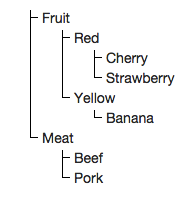 * If the tree I used as an example in this post looks familiar, it's because it's been used by someone else to illustrate efficient storage of trees in relational databases. I stole it from there. † If this doesn't highlight one of the problems with the HTML format, I don't know what does.